Zippy, cozy, and just downright perfect for a cold day!! 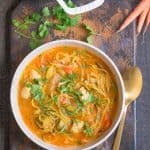 This simple Spicy Chicken Zoodle Soup has all of your favorite ingredients of classic chicken soup, but is elevated to a whole new level with the addition of Buffalo hot wing sauce, and zucchini noodles. Low carb, easy, and so delicious! Day after Thanksgiving and all I can think of is when I can eat my favorite soup. Is that weird? Probably. Considering most people want nothing to do with eating after Thanksgiving. But me, I’m always thinking about food. 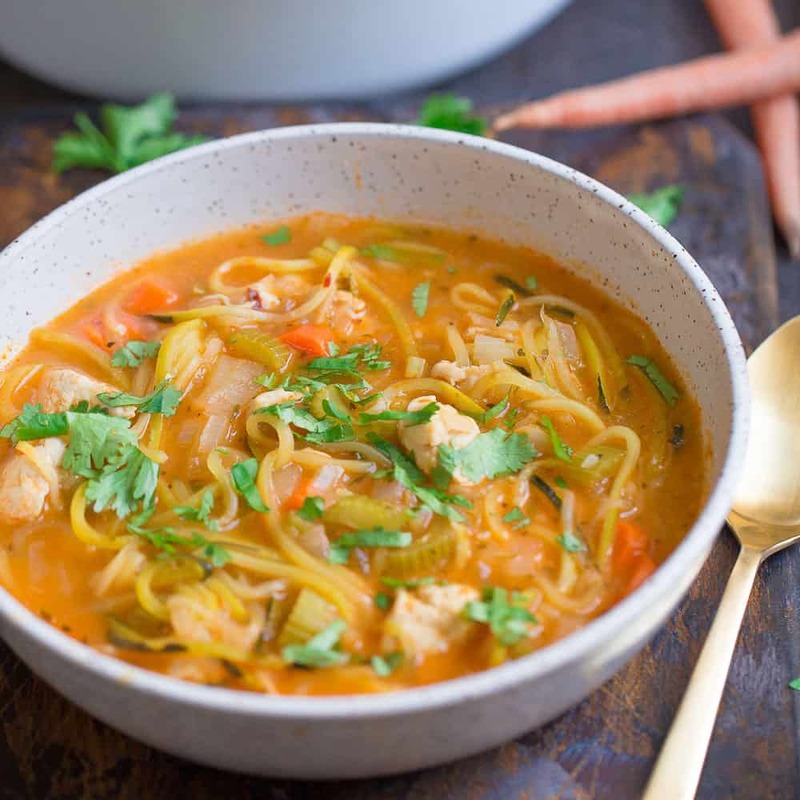 I am particularly obsessed with this soup because it’s just like a homemade chicken soup, BUT with the addition of buffalo wing sauce. It’s kind of my favorite condiment. 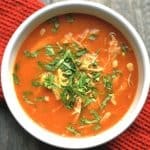 Although I might not be big on buffalo chicken wings, I am totally on board with buffalo chicken wing soup! And that is what we get here. 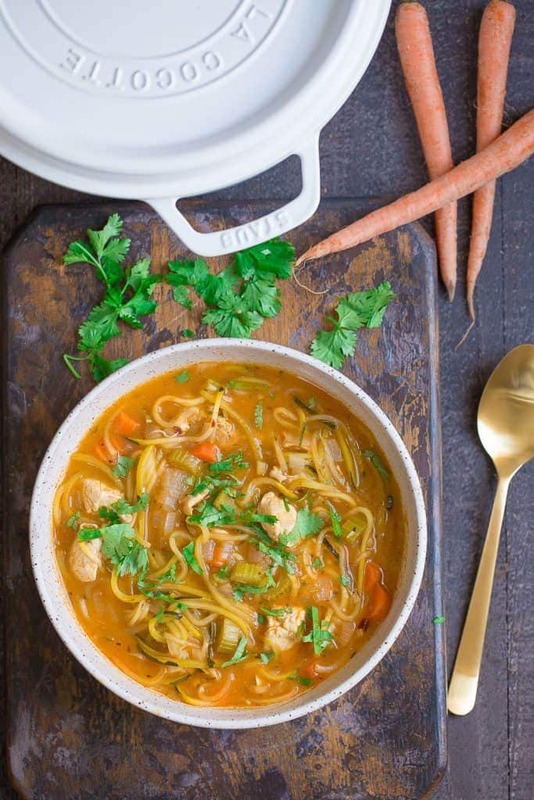 With football season in full effect, this soup is a no-brainer for a healthy option! All the taste you love, but low carb and very filling. 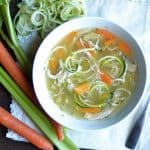 Zucchini Noodles make a great replacement for regular noodles, not something you miss in this soup. Just ask my pasta loving kids! 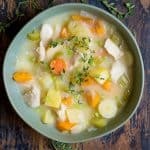 This delicious soup is one we make all the time at my house, it’s a family favorite! So much so, that it was one of the first recipes I knew I wanted to include in my cookbook. 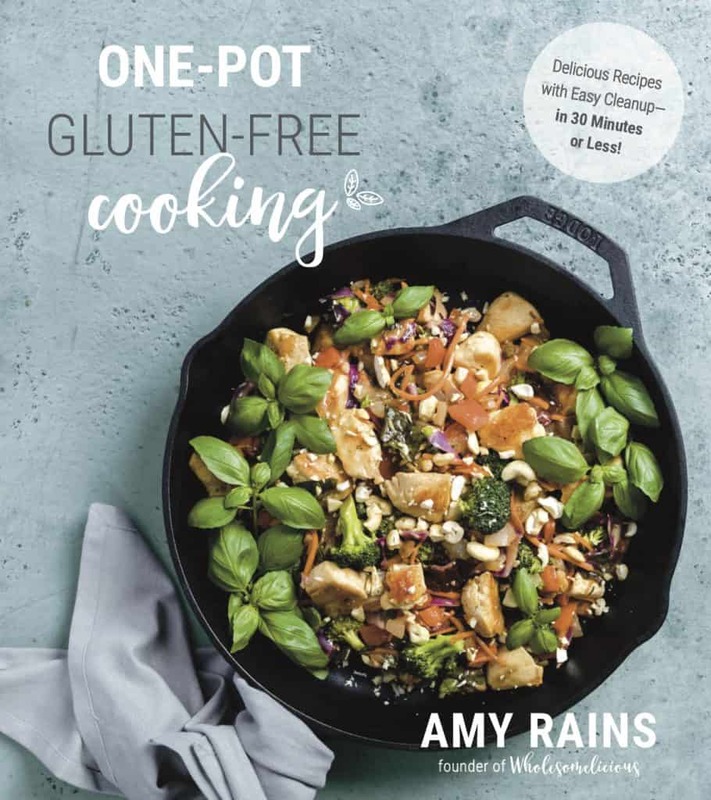 So here I am sharing with you today, a recipe from my One Pot Gluten-Free Cooking book!! The book is set to be released in just a few weeks! 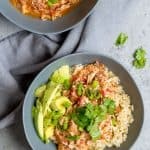 Filled with simple weeknight dinners, broken up by chapter based on what pan/pot/appliance you are using (Sheet Pan, Skillet, Instant Pot, Soup Pot, Muffin Pan, Casserole Dish, and Blender). 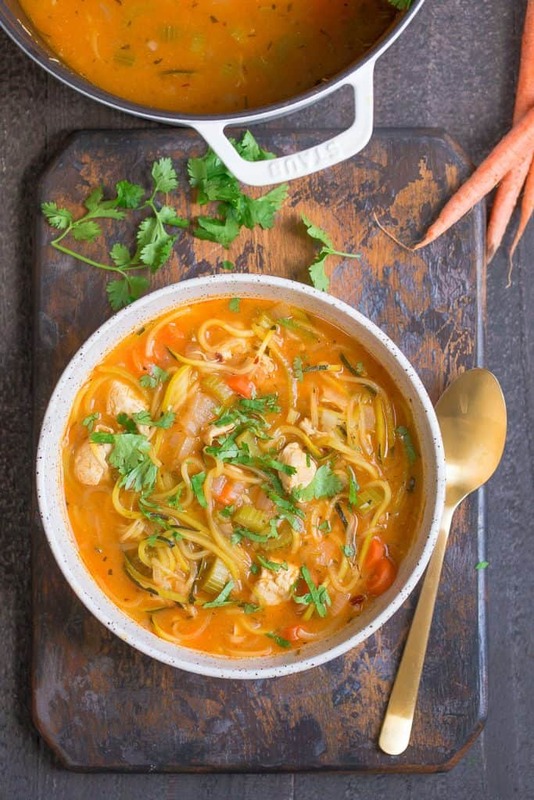 This Spicy Chicken Zoodle Soup is straight out of the the Soup Pot chapter. Meals are all made in 30 minutes or less and in one pot/pan. The ultimate easy meal book! Another side note on this recipe, you can make in the Soup Pot, Instant Pot, or Slow Cooker. I will put instructions for all 3 below. AND, you can also use leftover turkey from Thanksgiving! Heat a large stock pot to medium heat. Once hot, add the oil and saute the onion for 3 minutes. Place chicken, salt, and pepper into the pot. Saute with the onion for another 3-4 minutes. Add celery, carrots, chicken broth, and hot sauce. Bring to a boil, reduce heat to a simmer and add zucchini noodles. Let simmer for another 5-7 minutes before serving. Garnish with fresh cilantro. Select the saute function on your Instant Pot. Once hot, add the oil and saute for 2-3 minutes. Select cancel. Place chicken, salt and pepper, celery, carrots, chicken broth, and hot sauce into your IP. Select manual (or pressure) and cook on high pressure for 7 minutes. Use a quick release. Once the lid is removed add the zucchini noodles. Let sit on the keep warm function for another 8-10 minutes before serving. Garnish with fresh cilantro. Place onion, chicken, salt & pepper, celery, carrots, chicken broth, and hot sauce into your slow cooker. Cook on low for 4 hours. Remove the lid, add the zucchini noodles, and keep cooking for another 15-20 minutes before serving. Garnish with fresh cilantro. *Adjust your hot sauce to your personal liking. I much prefer 1/2 cup, but it may be too spicy for others. Start with 1/4 cup and adjust as needed. I just made this and it is amazing. I added broccoli to it and used lentil noodles.